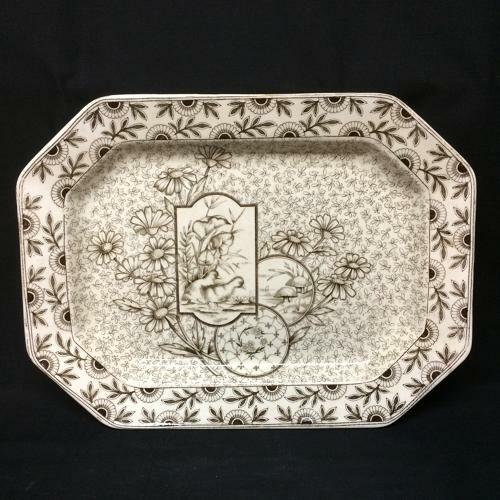 This Victorian brown aesthetic 14 1/2 " long x 10 5/8 " wide platter is transfer printed in very dark brown. The DEVONSHIRE pattern features a fancy pin wheel flower border around a completely covered well with oversized daisy type flowers and three magnificent cartouches. One has a quarter moon rising over hillside mushrooms, another is of flower chains, and the largest features young ducklings surrounded by lily pads and towering aquatic foliage. Great condition. No chips, cracks, hairlines or repairs. Very clean and ready for use or display.